Greg LeMond’s favourite career moment is probably one that few people actually witnessed. Aged 18, LeMond stormed onto the world scene at the Junior World Championships in Argentina, medalling in three disciplines on both road and track. The win marked the American’s readiness to enter the professional ranks and, courted by Bernard Hinault and coach Cyrille Guimard, he joined the Renault team in 1981. Before the move to the professional scene, LeMond won Circuit de la Sarthe and was in contention to win at the Ruban Granitier de Breton when he punctured. The American was reportedly angry that his team car was nowhere to be seen and vented this when it finally arrived with a spare wheel. The incident made Guimard want to sign him even more, according to Richard Moore’s Slaying the Badger biography. LeMond didn’t hang around when he reached the professional stage. He won three stages on his way to the overall Tour de l’Avenir in 1982 and finished second in the World Championships the same year. Italian Giuseppe Saronni outsprinted the American in front of the thronging crowds at Goodwood — the last time the Worlds came to Britain. LeMond’s wait for a rainbow jersey was not to be a long one, however, coming back the following year to triumph in Altenrhein, Switzerland. The win saw LeMond become the first American to win a World Championships road race, with Lance Armstrong joining him on the list 10 years later. Wearing the rainbow jersey for the first time, LeMond stormed his way to third place in his first Tour de France in 1984, picking up the young rider classification too. 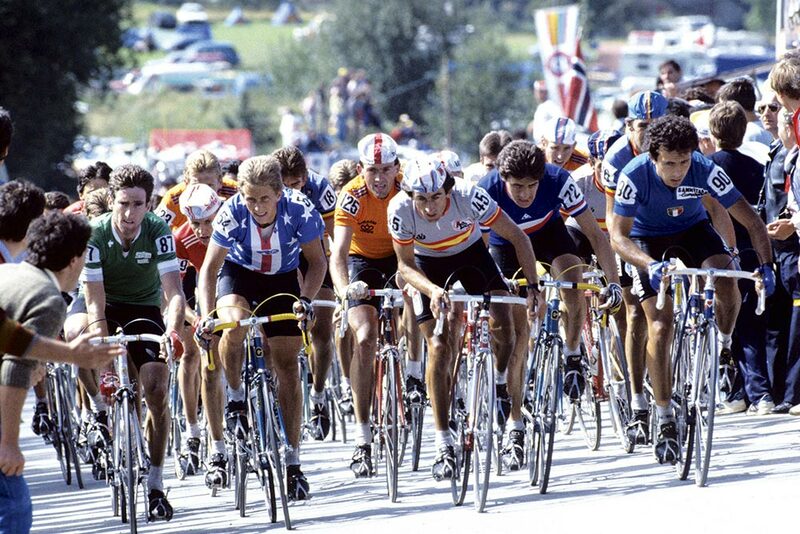 The American’s form in the 1985 season was equally remarkable, with podium finishes in both the Tour and Giro d’Italia, and another second place at the World Championships, this time losing out to Joop Zoetemelk. It was in LeMond’s sixth year as a professional that he stood on the top step of the Tour de France podium, having beaten team-mate Hinault for the yellow jersey. LeMond was officially a co-leader of the La Vie Claire team, along with the ‘Badger’, but Hinault looked certain to claim his sixth Tour title halfway through the race. 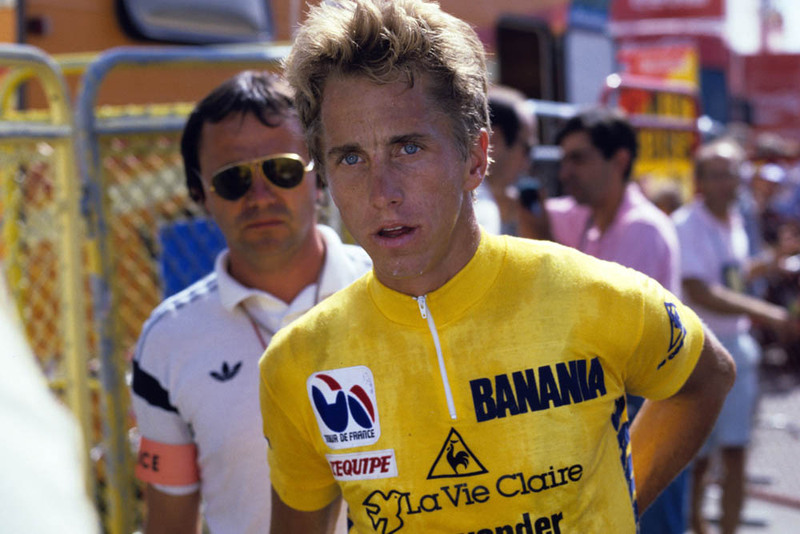 However, not even a five-minute time deficit could dissuade LeMond from chasing the title, and the American clawed back four and a half minutes the following day. 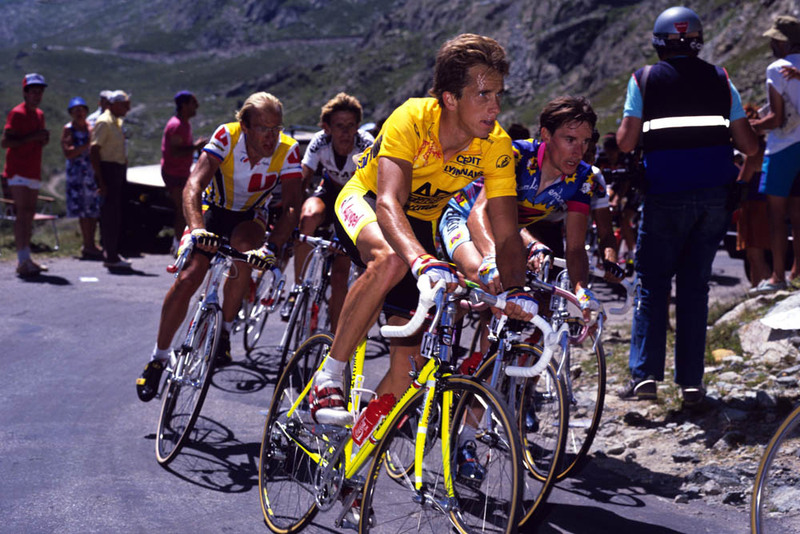 The yellow jersey was on LeMond’s shoulders after stage 17, setting up a famous tussle on Alpe d’Huez where the duo finished side by side. 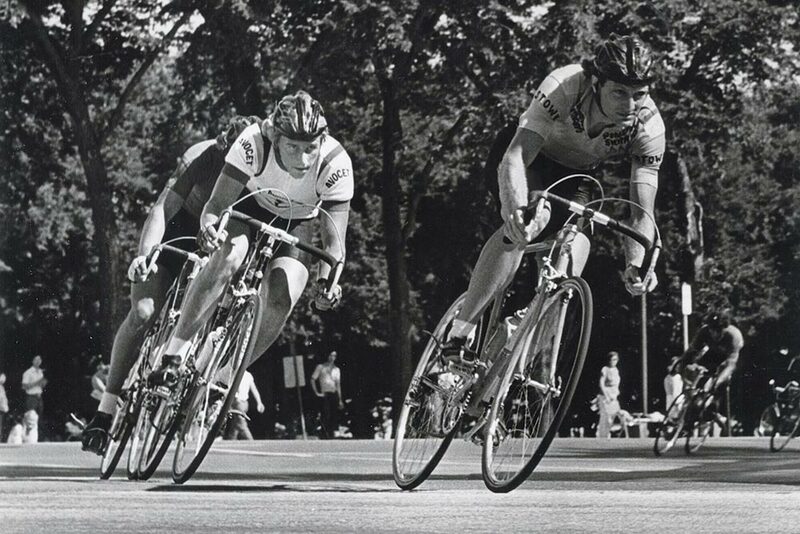 Wave after wave of Hinault attacks failed to break the American, who rolled home in Paris to take the overall win. “Athletically it’s the one I’m most proud of. It’s the one when I beat one of the best riders of all time, and I beat him fair and square,” said LeMond. LeMond’s 1986 Tour win was followed by a two-year absence from the race. A hunting accident, which left him with 35 shotgun pellets in his body, ruled him out of action in 1987 before tendonitis scuppered his return in 1988. But even pellets in his liver and heart would not stop LeMond from returning to the Tour, and he did so with a bang in 1989. A rare final stage time trial from Versailles to the Champs-Elysées would see LeMond and the 1984 champion, Laurent Fignon, go head-to-head in the closest finish in Tour history. 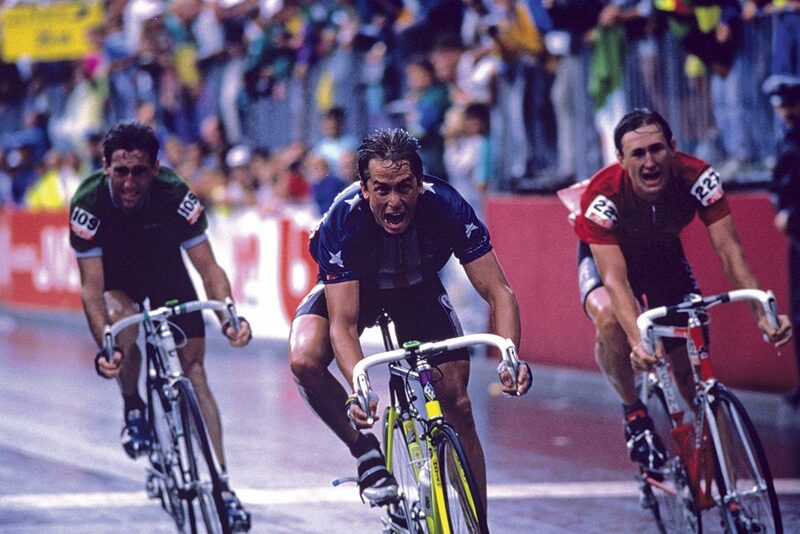 Setting off 50 seconds back on Fignon, LeMond rode the time trial of his life to win the Tour by eight seconds. “I get so nervous when I know I can do well,” he said. “I warmed up in the morning and did some calculations in my mind based on our times from the Giro. I knew that I could probably win without the aero bars, but it would be incredibly close. “I actually thought I would take more time out of him than I did, but I felt so good in the morning and told everyone I was going to win it. I never did that because it was like a jinx. I was super-nervous, but it was a really fun ride. Even after that finale, LeMond still wasn’t through with the French race, and returned the following year to claim his third overall victory while riding for Z-Tomasso. “I wish this one was one of the Classics, but I never had a really good one!” LeMond joked. Instead, a second World Championship would have to suffice for the American’s fifth favourite career highlight. By winning the rainbow jersey in Chambery, France, in August 1989, LeMond became only the fourth cyclist in history to win both the Tour and the Worlds in the same season. LeMond edged out Dimitri Konyshev and Sean Kelly for the gold medal, ensuring he would ride the 1990 season in the multicoloured stripes. “Working with Guimard and knowing how to train in cycles was important,” he said. “Knowing about recovery and then when to overload and taper meant that I always did really well at the Worlds. While two rainbow jerseys would likely count as a successful career for most cyclists, LeMond remains disappointed that his Classics trophy cabinet remained bare. “For the Classics we followed too much of an old way of doing things. If I had trained for them like the Worlds then I’d have backed it up more. I would come into the Classics season slightly overtrained, but I loved training for them. this article originally appeared in the May 2015 issue of Cycle Sport magazine.